- Now including a TFT touch and graphics display. 2017-02-11 Added detailed instructions to compile source code. Also added some info and pictures describing the Tandem Match Coupler and AD8307 bridge. 2017-01-27 Uploaded revision 0.99 of the TFT version. Bugfix of Reverse Calibration feature, used for accurate calibration of the AD8307 for the Rev signal. 2016-12-15 Uploaded revision 0.98 of the LCD version. Encoder bugfix. 2016-11-22 Uploaded revision 0.96 of the TFT version. Minor cleanup, Background Picture now shown in screensaver mode. 2016-11-22 Uploaded revision 0.97 of the LCD version. Minor cleanup, better pushbutton management. 2016-11-14 Uploaded revision 0.96 of the LCD version. Fixes a pin assignment discrepancy for the Enact switch. 2016-08-21 Uploaded revision 0.93 of the firmware. Getting pretty good. 2016-08-19 Uploaded revision 0.91 of the firmware. Some further improvements. 2016-08-17 Uploaded revision 0.90 of the firmware. Bug fixes and improvements. ‪First publication of page 2016-06-11. The project described below is an update to this one. This update replaces the Teensy ++ 2.0 Microcontroller with the much more powerful Teensy 3.2 (32 bit ARM Cortex-M4 running at 96 MHz, see https://www.pjrc.com/teensy/teensy31.html). The measurement sampling rate has been increased from 200 to 1000 times per second (1500x if the microcontroller is overclocked at 144 MHz). Also, unlike the classic Atmel 8bit microcontrollers which only have one 10 bit A/D converter, this one has two A/D converters in parallel, capable of a simultaneous sampling of both the forward and the reverse input signals at a 12bit resolution. The same circuits can be used for the RF power coupler and the AD8307 as in the original Power and SWR Meter Project, however a few new builds are shown below. Alternately, a coupler with diode detectors can also be used. See appropriate #define[s] in the PSWR_X.h file, included in the source code. In this case one could for instance use a coupler like shown in the examples contained in the "BOM and Building Instructions document" at the bottom of my Magnetic Loop Controller page. However this approach will of course greatly limit the useful range of the meter. Two display alternatives are provided below, one similar to the original 20x4 character based LCD, and a new, much nicer looking alternative, using a 2.8 inch TFT display and touch screen. All screenshots below are actual snapshots of the TFT LCD alternative. All other functions, including calibration, setup and other configuration menu management, as well as USB interface commands and data polling, are similar to those described on the webpage for the original project. PSWR_T_xxx.zip contains the TFT LCD version. PSWR_I_xxx.zip contains the 20x4 LCD version. The TFT and touch screen version of the meter, all boxed up in a small aluminum enclosure. Below, cutouts have been made in the box, it spray painted black and the LCD + touchpanel has been inserted. Note that appropriate spacers have to be used to ensure that the edges of the touchpanel do not come into contact with the box. "A third version, a combined Tandem Match Coupler and Detector Circuit". Only one of the three connectors on the back panel is used for this project. The other two are for prototyping purposes, one for I2C and the other to bring out a couple of I/O pins. Like the previous version, this one provides for instantaneous power reading, 100ms peak reading, 100ms average, 1s average and PEP. This screen shows a steady carrier of 103W at an SWR of 2.5. The PEP reading is visualized by a second bar, going further than the first one – just barely visible on this picture as the difference is less than 1%. Below we have an indication of an SSB signal. Here the PEP bar is visible beyond the Peak Power bar. SWR is above the Alarm setting of 3.0, so the Power level is now shown in Red and an Alarm Output has been set. A single tap on the lower 1/3rd of the Touch Panel is used to clear the SWR Alarm. Clearing the SWR Alarm reverts the Power indication back to Yellow and de-asserts the Alarm output signal (see schematic). Here we are in the 100ms Average mode. This mode works rather like an analog meter, movement is smooth and free of sudden jerks. I am showing signals with high SWR in order to better depict the SWR bar. Actual output power, of course, is FWD - REF. Last display mode selected is stored in EEPROM and will become default mode when the meter is powered up. Note that the PEP bar indication is also visible in every mode. PEP period is selectable in the Configuration Menu as 1, 2.5 or 5 seconds. Any of the modes above, will become the "Default Mode" if left running for over 10 seconds. When powered on, the Meter will start in the Default Mode. Tap anywhere within the green area to switch between the Default mode and the Modulation Scope. In case the Modulation Scope has been selected as Default Mode, the last mode selected as Default before selecting Modulation Scope, will be the "other" mode. A long push (>1 second) in the blue area will enter into the Configuration Mode, While in the Configuration Mode, the above areas are deactivated and on-screen touch buttons are used instead to navigate. see below. While the TFT version of the Configuration Menu looks a bit nicer than the LCD version it provides the same functions as before. Below are pictures of the top level menu functions. For a description of the lower level menu items, see the web pages on the original Power and SWR Meter Project. The mechanical encoder + pushbutton circuit shown is optional, but can be used instead of the touch panel. Signals identified but unconnected, are for potential future expansion of the project. R4, shown as 10 ohms controls the current to the TFT backlight. Some people find the backlight to be too bright when using 10 ohms. In that case, 22 or 33 ohms may be a better value. In any case, Digital Pin 6 (8) provides a PWM modulated output that can be used for Menu controlled TFT brightness adjustment. This will require some additional hardware, such as two generic low power (~200mA) transistors (1xNPN, 1xPNP) and two resistors, or a "high side switch", such as MIC2005. The meter is powered through the USB port. With 30 turns on the secondaries and the capacitor at 22 pF I get lowest SWR at 1.03 at 28 MHz when transmitting into a good dummy load. 1.13 at 50 MHz. 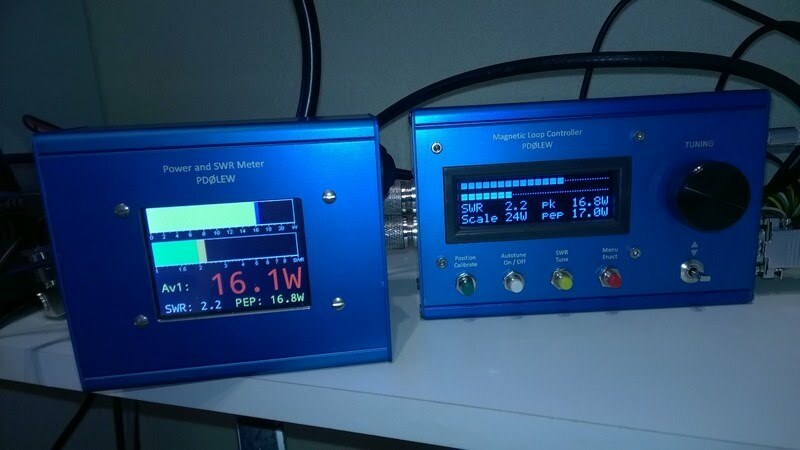 Two 50 ohm dummy loads in parallel should give an SWR of 2.0. I get just over 1.85 at both 28 and 50 MHz, good enough. However - If you are using the meter for power levels of 600W or less, then I would recommend that you change the transformers to 20 turns. This will give a much better isolation at the higher end of the band and may even make the meter perform well at 50 MHz. In this case, the capacitor will also help even further, but I suspect about 5 - 10pF would be a good setting. An improved layout, including gerber files, by Johan PD0LEW, based on the above, is now available at his group page: Radio Stuff. The firmware is is free software, released under the GNU General Public License. Note that certain firmware features can be tailored through modification of parameters in the PSWR_x.h file included in the source code for the firmware. The firmware source code is commented throughout and should hopefully be relatively easy to understand/modify/expand/adapt. Make sure to select all Libraries when you install the Teensyduino extensions, the source code uses several of those. 1. Extract the zip file containing the TFT or LCD source code version. A number of files will extract into a folder with the same name. These files are the source code. 2. Browse into the folder and double click on the file called PSWR_T_xxx.ino or PSWR_I_xxx.ino, this is the “master” file. The Arduino software environment should now open a window displaying the source code. If Arduino opened another window as well, called sketch something, just close that one. Note that any text written after “//” is regarded as comments and is ignored. 3. In the Arduino Tools tab, double check that Teensy 3.1/3.2 is selected as a "Board:"
4. In the Arduino Tools tab, set "Optimize" to "Faster with LTO". If LTO is not selected, then the firmware will not run correctly. 5. Connect the Teensy 3.2 microcontroller to the computer with a USB cable. 6. 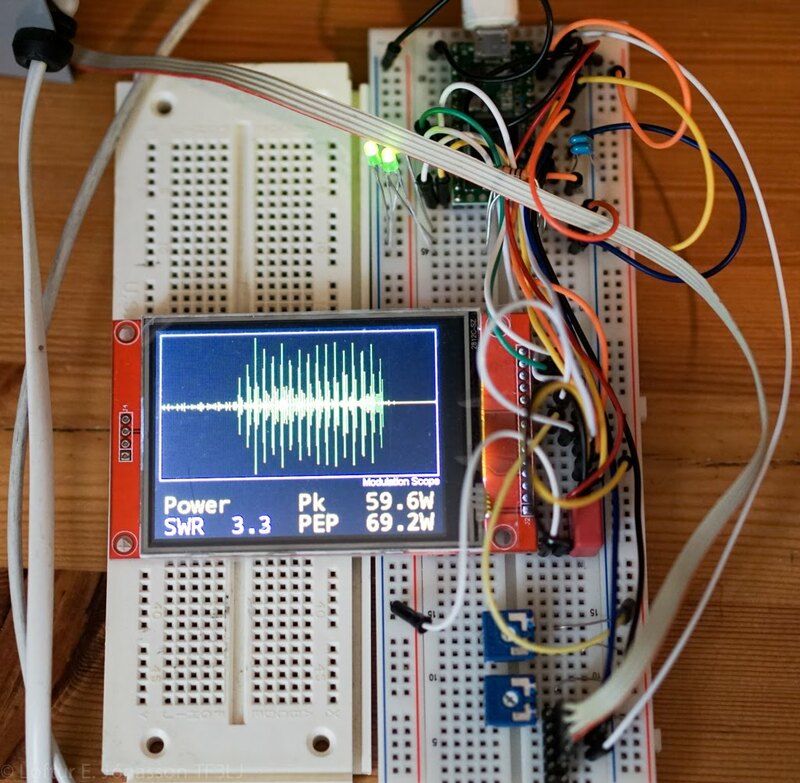 In the top left corner of the Arduino window, click on either the tick sign or the right arrow. Now everything should hopefully compile without errors and automatically load itself to the microcontroller. No worries, if something went wrong, then nothing will be uploaded. That is all covered in this update. For more information, please refer to the original project. To download any of the files below, please click on the down arrow ďat the right hand side of the file.